To some, this article might be received as petty – perhaps even naggy. This isn’t a disclaimer, nonetheless; but I can certainly understand if you think I’m harping on Maryland Delegate Neil Parrott. I promise I’m not, but Parrott is viewed as a shrewdly seasoned politician, immune from making amateur mistakes. That’s why his latest email blast is so inescapably important. 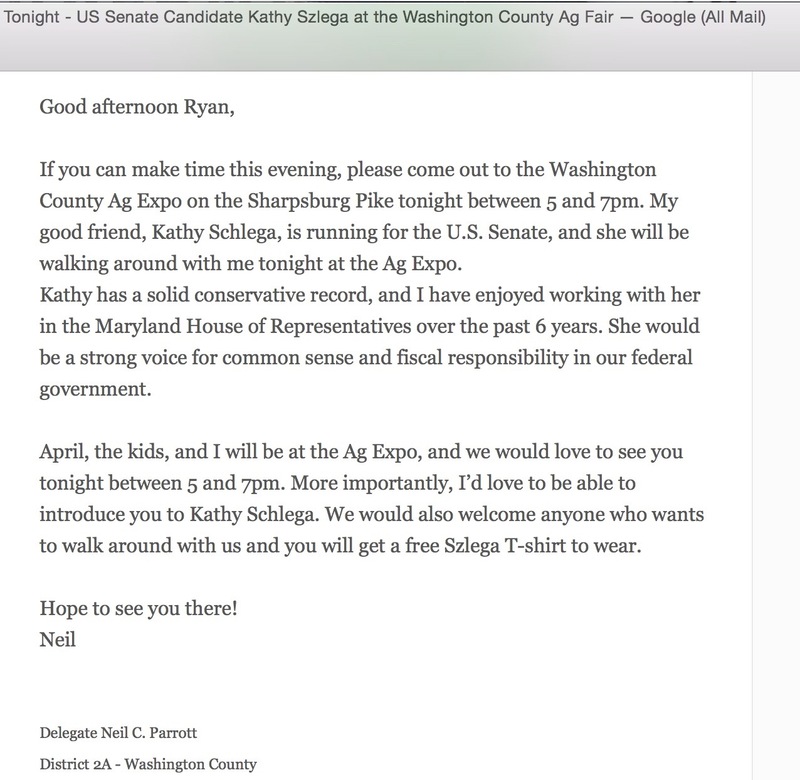 Neil Parrott fired off an email blast this afternoon, at 1:50 p.m., that invited his subscribers to join him tonight at the Washington County Ag Expo. Also joining Parrott this evening is Maryland’s Republican U.S. Senate candidate Kathy S-Z-E-L-I-G-A. Except that Parrott, who describes Szeliga as a “good friend,” cannot spell the Senate hopeful’s name correctly to save his life. Two separate versions of Szeliga’s name appear in Parrott’s unpolished email to supporters: Szlega and Schlega. To the undiscerning eye, Parrot’s spelling errors can be chalked up to an innocuous mistake. Or maybe it was a staff member who wrote the email and Parrott didn’t have time to review it before it hit our inboxes. I’ll give Parrott the benefit of the doubt: after all, Szeliga’s last name isn’t a common name, and it’s easy to misspell. However, Parrott has worked with Szeliga in the House of Delegates for, as he wrote, “6 years.” Sloppy, no, or am I being overly picky? You decide. For Parrott – a political expert, apparently – this release is shoddy and low grade. The right-wing delegate’s constituents laud him as a “political guru” of some kind, but this email blast certainly doesn’t reflect the professionalism of a sitting member of the Maryland House of Delegates. For a guy who is itching to take on an incumbent Republican state senator in 2018, he can’t afford another amateur email blast like this. Despite the spelling error, I emphatically encourage all Marylanders to support Kathy Szeliga this November! We need Kathy in the U.S. Senate. Neil Parrott will fight for your Civil War statues!